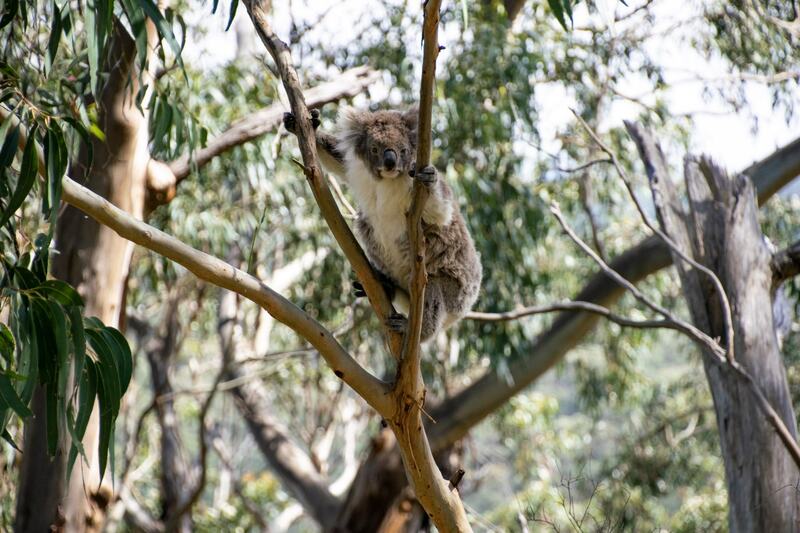 Without a doubt, the best place to see wild koalas in Australia is along Kennett River’s koala walk. 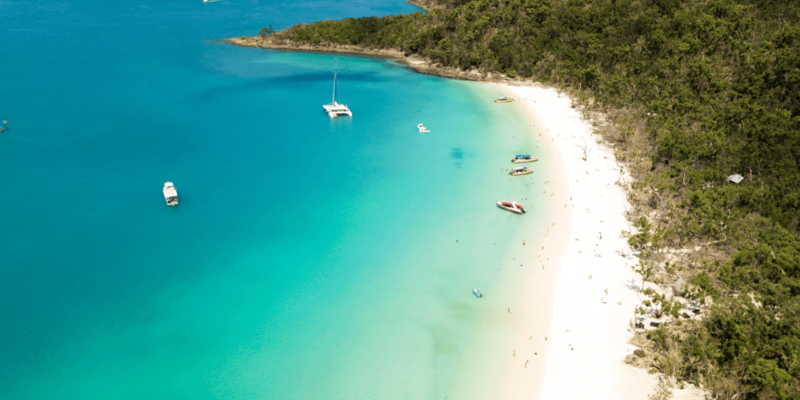 Located along the Great Ocean Road in Victoria, Kennett River is absolutely brimming with wild koalas, and your chances to spot them are better here than anywhere else. Even though koalas are almost a national icon for all of Australia, they are only found in a few different places around Australia. They live in the coastal areas of Australia, around Victoria, Queensland, New South Wales and South Australia. But just because they’re found in half of Australia, it doesn’t mean you have a good chance of spotting a wild koala. Contrary to what international visitors believe, it’s not that common to see native Australian animals out and about in the wild. Despite living in Australia for my whole life, I’ve had hardly any koala encounters out in the wild. Which is what makes spotting one in the wild so exciting, even at 27 years old. 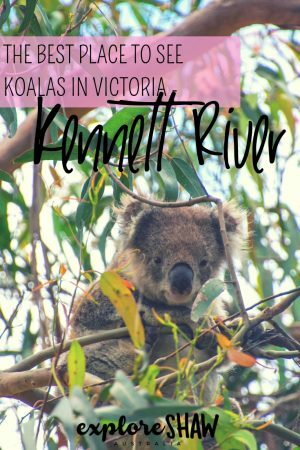 A couple of weeks ago we headed down to Kennett River to see how many koalas we could spot in the wild, and we were not disappointed. 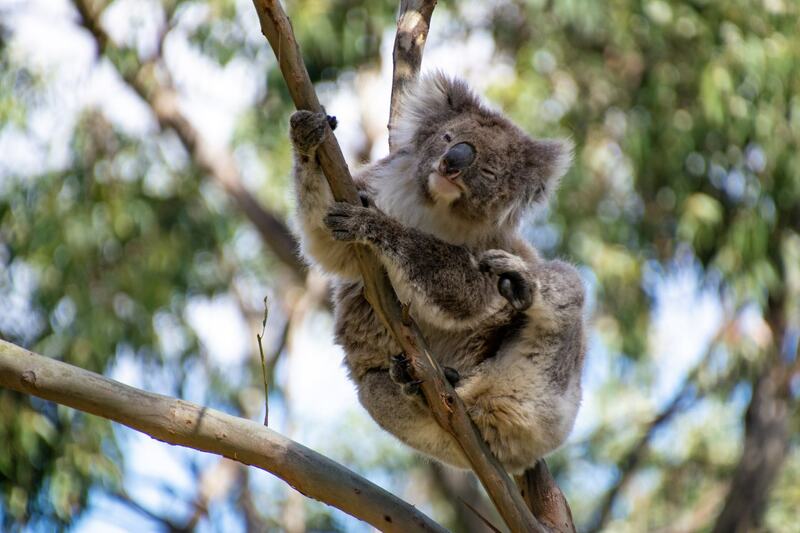 Kennett River is home to one of Victoria’s biggest koala colonies and there’s no better place to go if you’re hoping to see some of these furry faces in the wild. 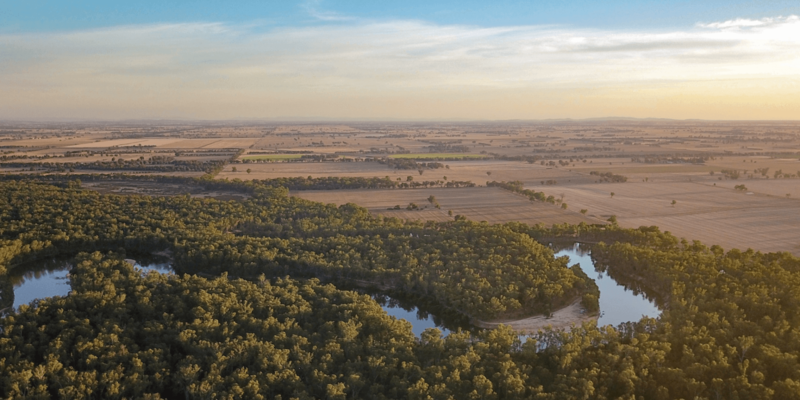 Where is the Kennett River Koala Walk? Sitting about half way between Lorne and Apollo Bay, Kennett River has a secluded spot along the Great Ocean Road. The drive from Melbourne takes about two and a half hours along one of the most beautiful winding roads in Australia. When you get to Kennett River turn down the road towards the Kennett River Holiday Park. Right behind the park there’s a small road turning off to the left, where you’re likely to find tourists feeding a lot of bright colourful birds and even some ducks. 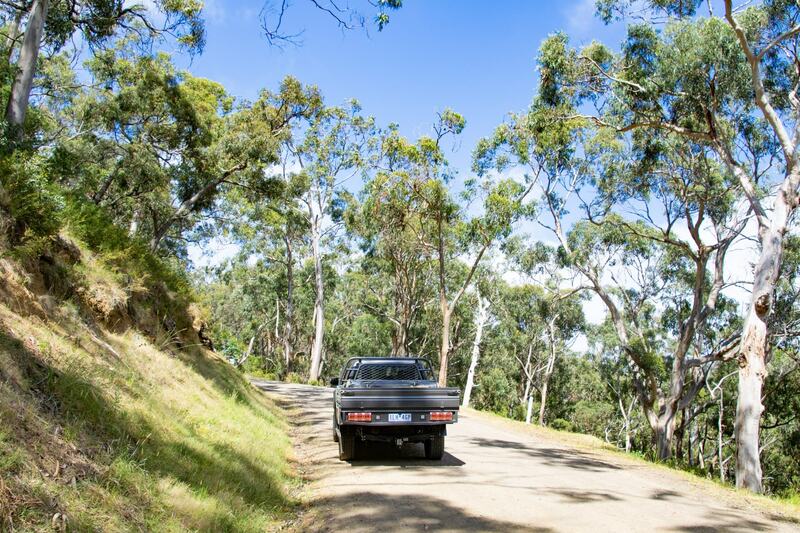 Despite being called the Koala Walk, the best way to experience Kennett River is actually by car. If you can make your way through the people feeding the birds and standing right in the middle of the road, you actually can drive down the koala walk road – although you will need to be super careful of ducks, wildlife and kids with careless parents. Grey River Road winds from Kennett River Holiday Park, up in to the forest that lies along the coastline, and there are thousands of koalas living along this road. 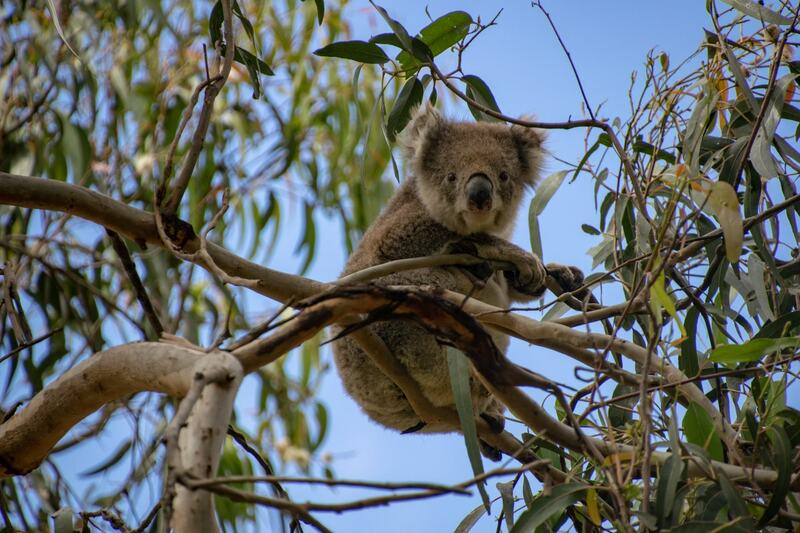 As long as you’re keeping an eye out for other cars and pedestrians, you can take your time driving super slowly along the road while you spot koalas in the trees above. The road is very quiet and often you might be the only one there. 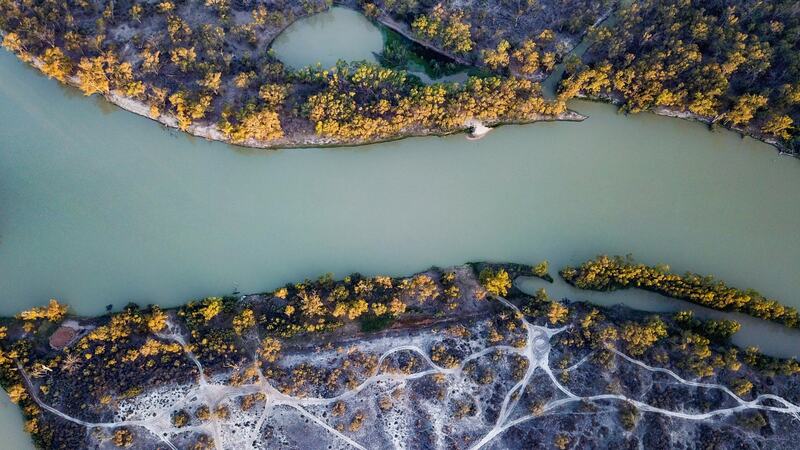 I’m not sure how far Grey River Road heads inwards, but it might be for quite a long way. We kept driving until we found ten koalas in the wild before we turned around and headed back towards the Great Ocean Road. Of course, we kept our eyes peeled on the way out as well, because some of the sleeping koalas had woken up by the time we were heading the other way. 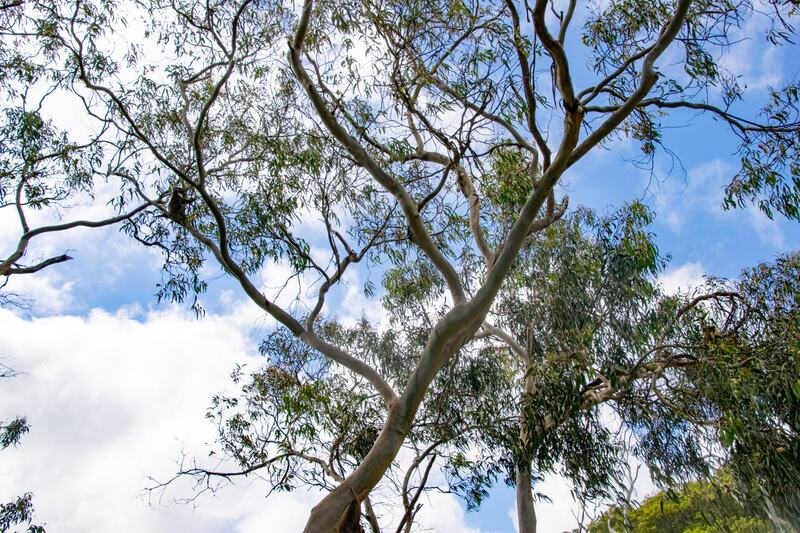 There are TWO koalas sitting in this tree – can you spot them? 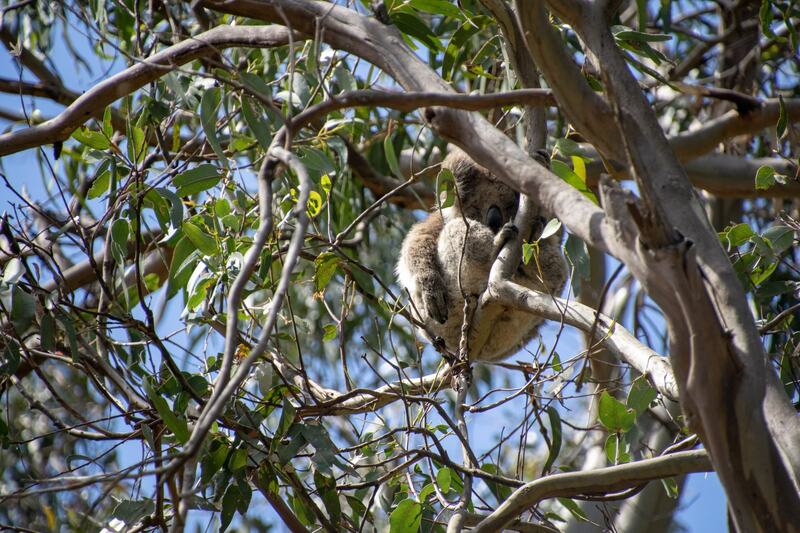 As we were driving around Grey River Road, we actually spotted ten koalas. Yep, ten super cute sleepy koalas, hiding high up in the trees and having their morning breakfast. They’re not easy to spot though! They’re fantastic at camouflaging themselves high up in the trees, so they’re not easily spotted. Drive super slowly, turn your radio off and keep any noise to a minimum. 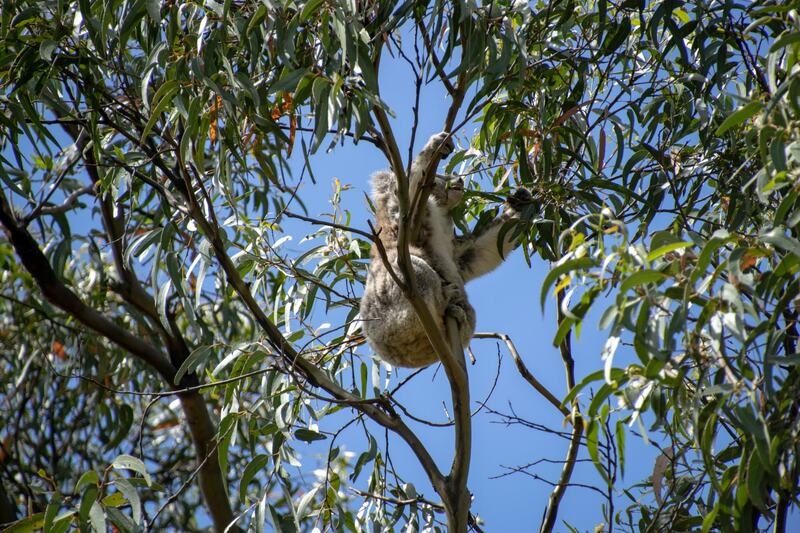 Look up to the tallest branches of the trees, as this is where koalas are most likely to be sleeping. If you find one koala take a minute to have a good look around and see if you’ve missed any others, often they are sitting on opposite ends of the same tree or very close together. Take a camera with a big zoom if you want to photograph any koalas you see, iPhones are not going to cut it here, these koalas are going to be pretty far away. We used a Nikon 18-300mm zoom lens (almost always fully extended to 300mm) for these photos. Koalas are notoriously sleepy animals, spending more than 20 hours of their day sleeping high up in the trees. This makes them super hard to spot in the wild, and it’s even more unlikely to see them awake or moving around. 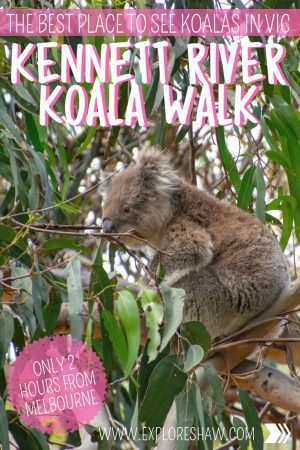 For your best chance at not only spotting koalas at Kennett River, but also see them moving amongst the trees, the best times to check out the koala walk is either early in the morning or late in the afternoon. In the morning hours, after the sun has risen is when lots of these little guys stretch their legs and move around for a bit of breakfast. Another good reason to visit early in the morning is to avoid the tourist buses. Kennett River is actually on the Great Ocean Road tourist trail for some tour companies, and from the early afternoon tourists can pile off buses in huge crowds. Having visited at both times I can definitely say that visiting in the morning is much more calm and peaceful, with way more koala sightings. 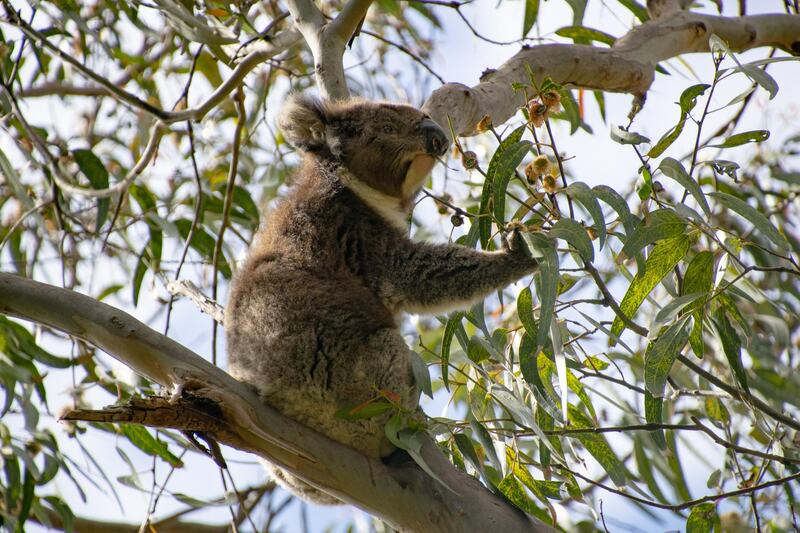 If you’re feeling hungry after a busy morning of koala spotting in Kennett River, take a minute to relax and grab a bite to eat at the Kafe Koala & General Store. You can grab a snack or a small meal and relax in nature before you hop back into your car and continue your road trip. Kafe Koala is located at 15 Great Ocean Road, Kennett River. Open from 7am to 7pm daily. 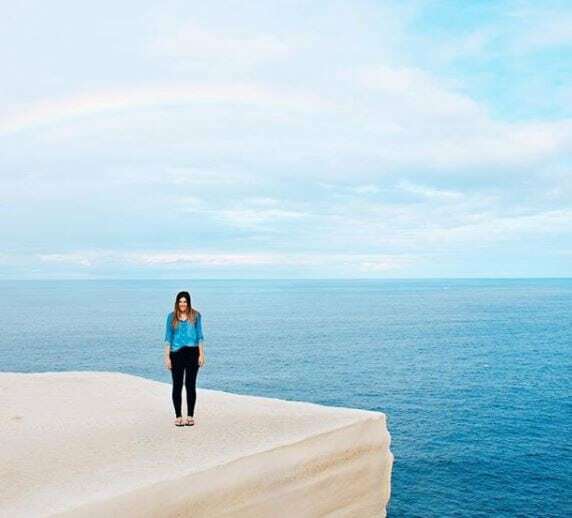 Check out all the Great Ocean Road day trips that include a stop at Kennett River. 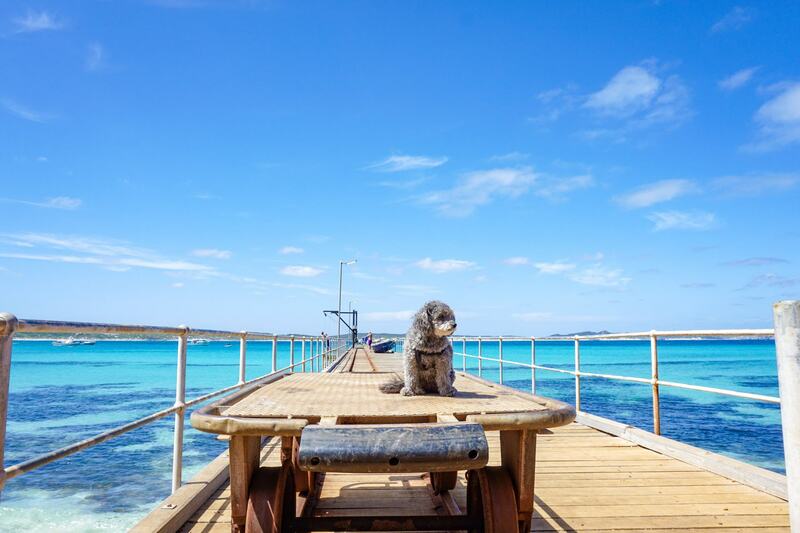 There’s are lots of different Great Ocean Road accommodation options for your visit to Kennett River, but if the point of your trip is to spot koalas then the absolute best place to stay is the Kennett River Holiday Park. 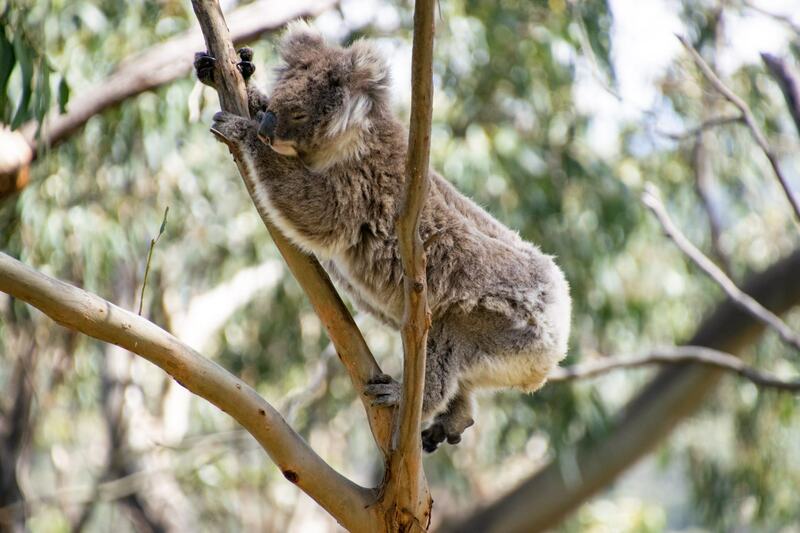 The Holiday Park sits just in front of the koala walk, and visitors staying here regularly wake up in the morning to spot koalas sitting on the low lying branches around the park. With the beach right across the street, it’s an ideal place for your Great Ocean Road holiday. The Kennett River Holiday Park can be found at 1-13 Great Ocean Road, Kennett River. Phone (03) 5289 0272 to make a reservation. For more of a luxury stay, and particularly a good idea if you’re travelling in a big group or with your family, book a holiday house with a beautiful ocean view. There are lots of houses to rent near Kennett River, as well as more accommodation options in both Lorne and Apollo Bay. In all of our travels up and down the East Coast of Australia, we’ve never visited a place where we’ve seen as many wild koalas as we found in Kennett River. It’s so exciting to see these guys in the wild, even if they are sitting high up in the trees. 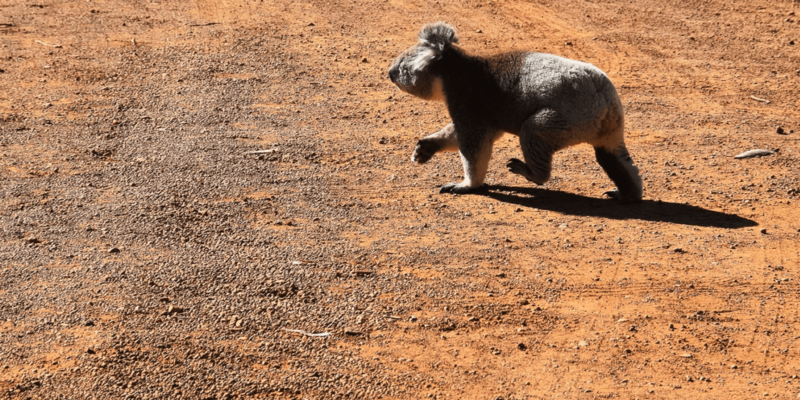 If you do have the joy of seeing a koala walking along the road or very close to the ground, make sure you keep your distance and never approach or touch any of the koalas. This is their home and it’s important that they always feel safe here. Where have you seen koalas in the wild? Share your best spots below!